Last weekend Jess and I headed up to Edinburgh – my very first trip to Scotland. 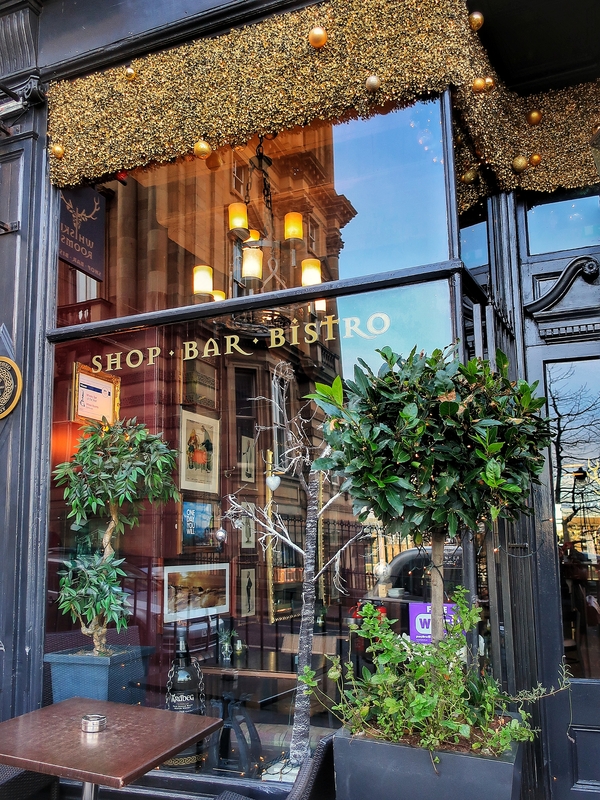 It’s December, as you know, which means it’s Christmas market season, and having already sampled our local festive stalls, I craved something a little more extravagant – something that would get me in the Christmas spirit. 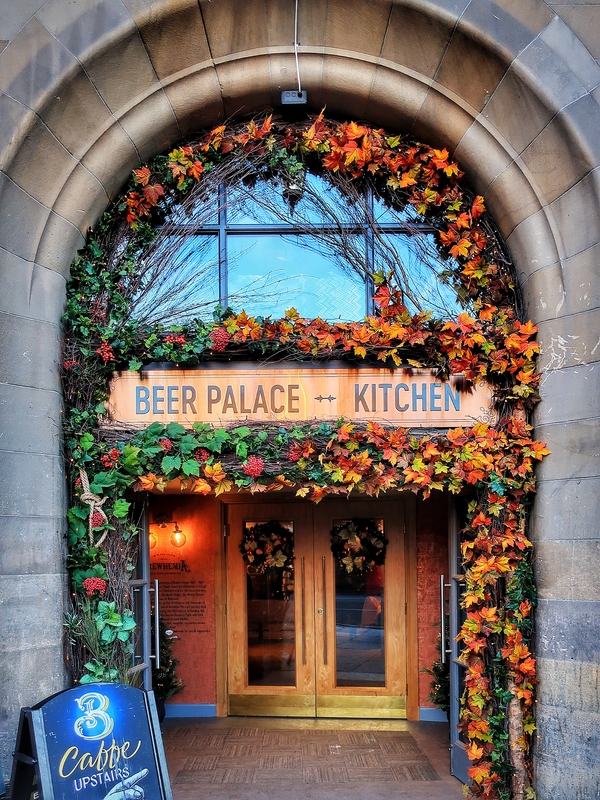 So we jumped in the car last Friday morning, and after around 8 hours of driving – yes, we were a little crazy to think that driving all the way to Scotland from Portsmouth was the best option – we arrived in the capital at our Air bnb and headed straight to Princes street market for some mulled wine and bratwurst. This city really knows how to celebrate everything festive. There wasn’t a single bare shop anywhere. Lights and wreathes decorated every building, and the market – it was one of the most magnificent, magical place I’d ever been. I must have dragged Jess around every inch of it, browsing scarves and candles, and eating every bizarre thing we came across – including an exceptionally delicious hollowed out roll, filled to the brim with molten cheese. After two days of exploring everything the city had to offer, it’s safe to say that I left feeling a lot more Christmassy than when I arrived. I thought I’d share some of my favourite festive photos from our trip for those of you who haven’t quite managed to shake off your inner Grinch yet. And if you want to know more about what we got up to throughout the weekend, you’re in luck, as I’ll be posting some geeky guides over the next few weeks. The Christmas Market on Princes Street is hands down the most festive place in Edinburgh. 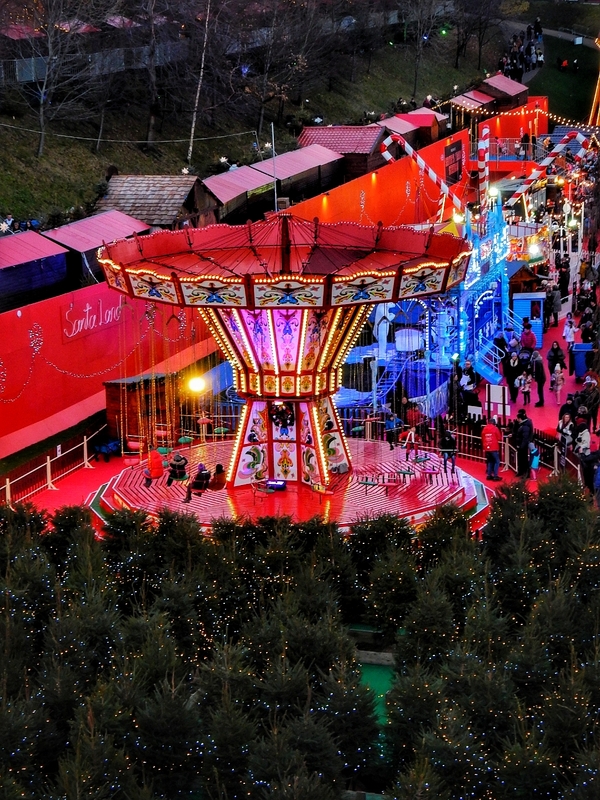 Filled with brightly lit wooden huts, fun fair rides and even a Christmas tree maze, it’s a photographers dream. 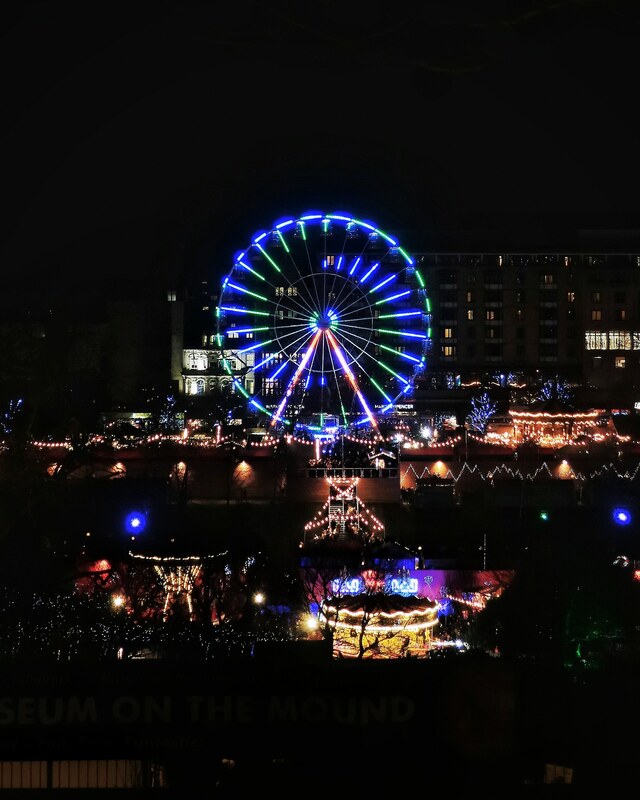 For one of the best views over the Christmas Market, head to North Bank Street. Make sure to get a photo of it at night when all the neon lights are glowing. 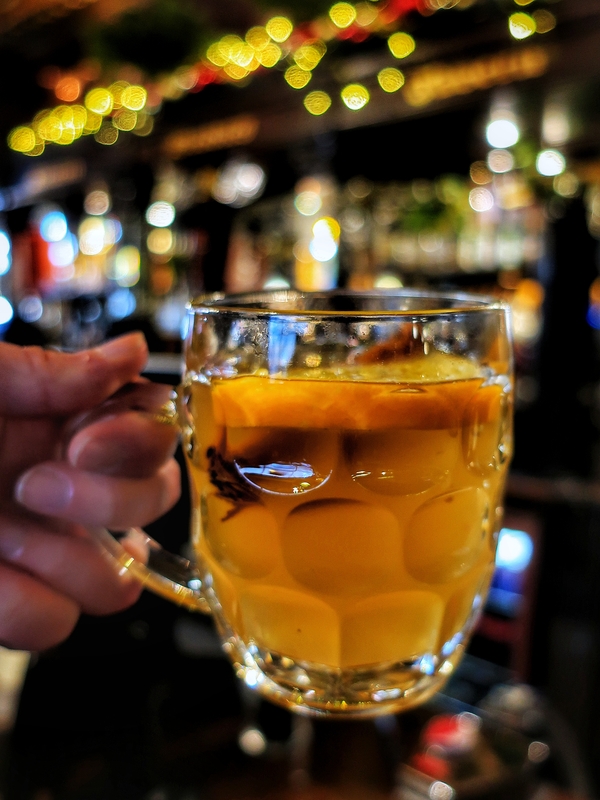 If you’re looking for some hot mulled cider, this beautiful little pub found on the Royal Mile serves up the best I’ve ever tasted; and with added cinnamon sticks, it looks amazing in front of the twinkling bar. 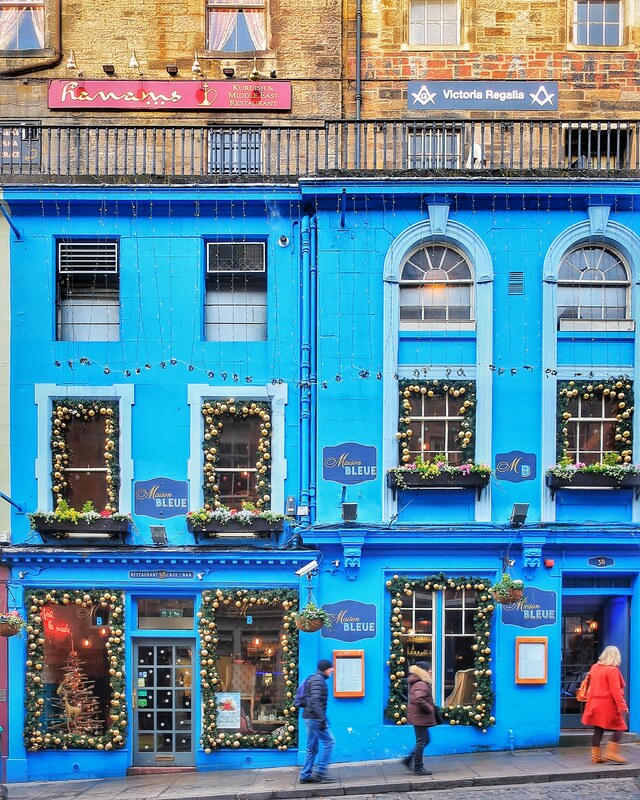 Don’t forget to check out the Royal Mile itself, each store and restaurant supplying their own take on Christmas. 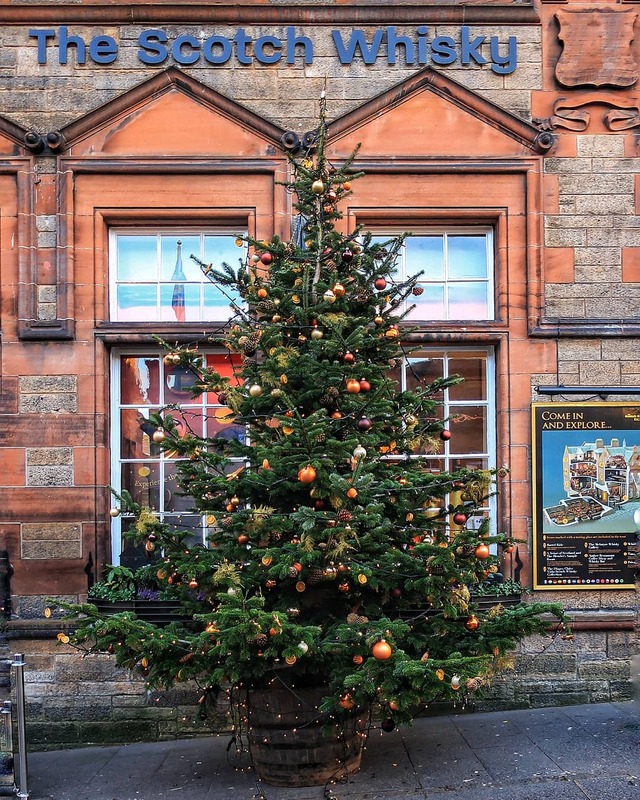 Look out for the magical courtyard at The Witchery, and the huge tree outside The Scotch Whisky Company. 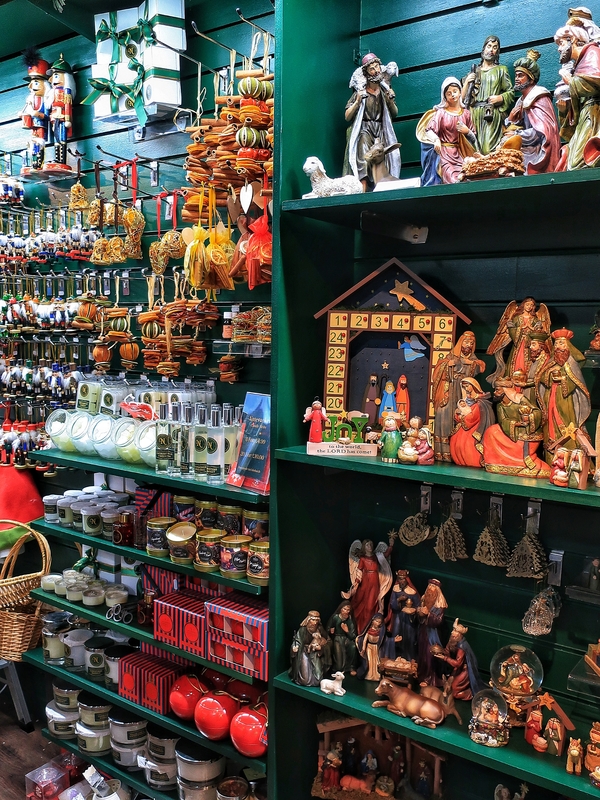 This little shop will give you ultimate Christmas inspiration. It’s filled to the brim with cute tree decorations and ornaments for your house. Possibly the most stunningly decorated bar I came across, the Brewhemia down Market Street offers up festive hot chocolate with floating snowman marshmallows. 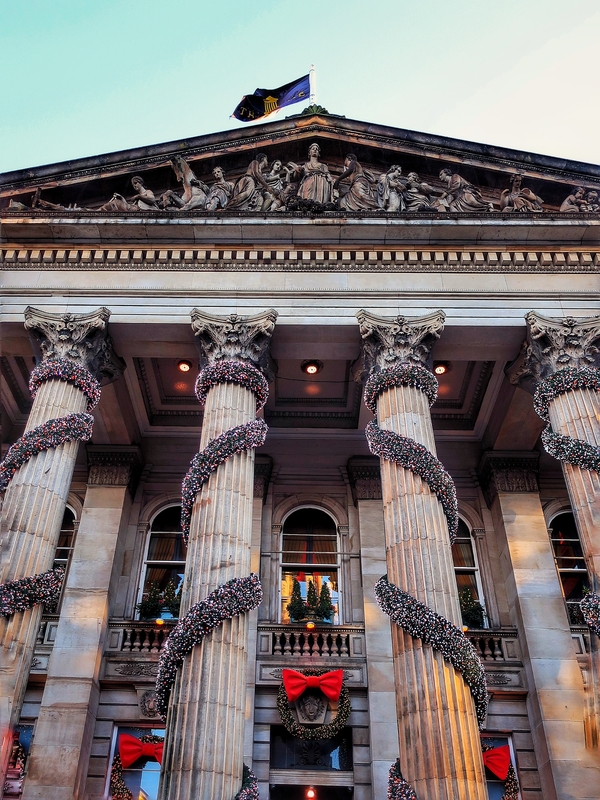 Victoria Street, with its cobbled road and colourful shops, is a must see no matter what time of year, but at Christmas it’s even more magical when each shop decorates its windows with lights and tinsel. This small market down George’s Street is home to the biggest dome of lights I’ve ever seen. It’s also home to the Ice Adventure which is filled with beautiful ice sculptures and an ice bar. 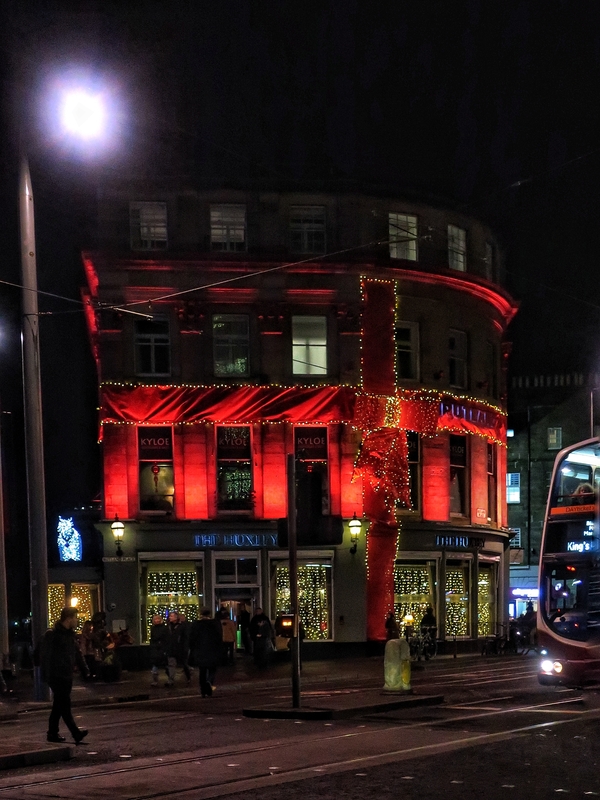 If you’re looking for the most festive building in Edinburgh, it has to be The Huxley. I mean – it’s wrapped like a present, in red ribbon. It looks amazing. 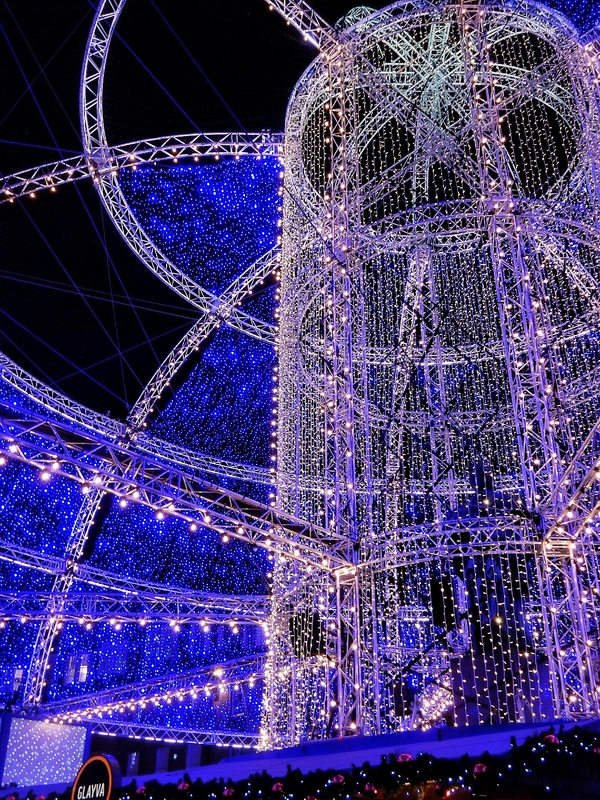 The Dome is a Christmas lovers paradise. Every inch of the building, inside and out is covered with spectacular decorations. It does get incredibly busy though, so expect to queue. Just down the road from The Dome lies another beautifully decorated building. 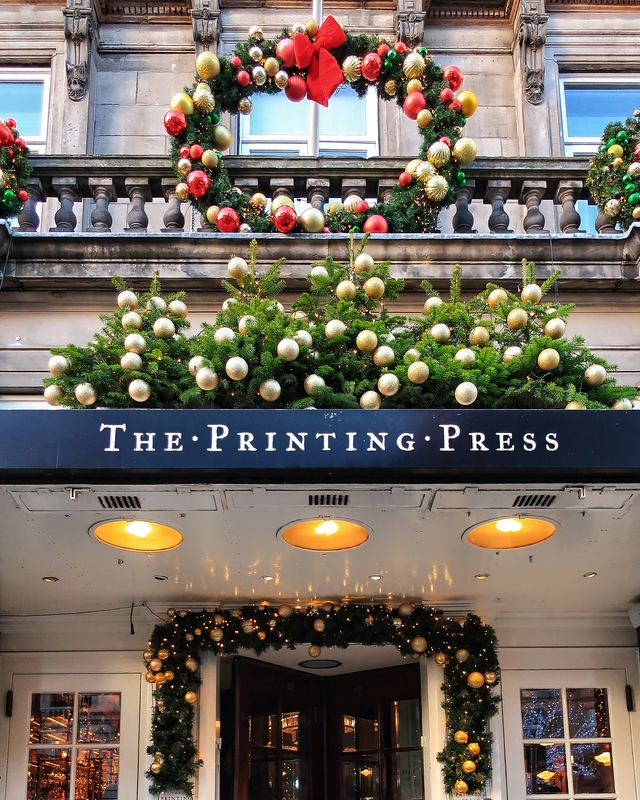 The Printing Press is Christmas goals with its giant wreathe and festive entrance. Another exceptionally decorated little building, the Whiski Rooms look like they’re probably pretty stunning all the time, but with that gold Christmassy trim they look particularly beautiful at Christmas. 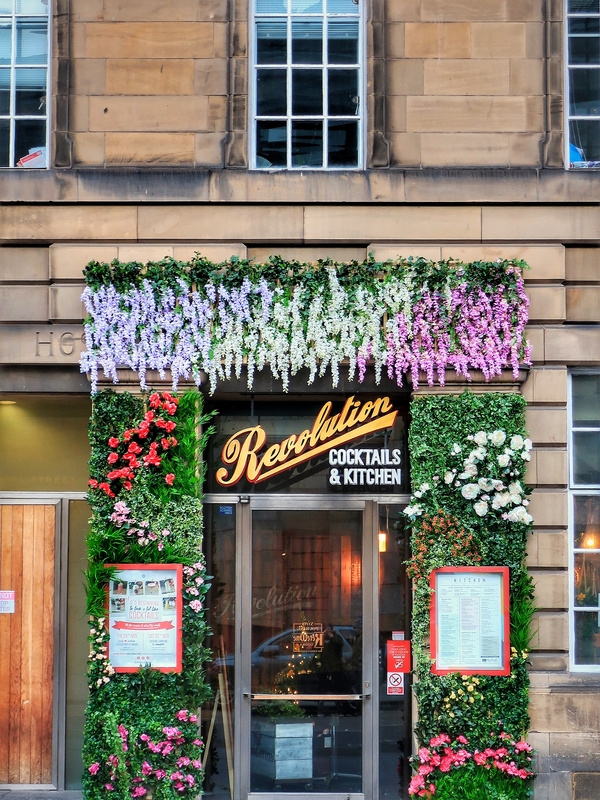 Because I’m not sure whether Revolution looks like this all year round, I’ve added the restaurant as a bonus. I couldn’t not really – look at that doorway. Have you ever seen anything like it? These are all really beautiful places! Wow! It looks amazing! I have to go to Edinburgh! Alas, I can’t during Xmas. Also: great pics!